PRM marine transmissions have established a world-wide reputation for quality, reliability and in-service performance, making them the ideal choice for pleasure, workboat and fishing vessel applications. All PRM hydraulically operated gearboxes feature a twin countershaft design, which enables full rated power to be transmitted in ahead or astern, with either left or right hand propellers. PRM80 and 120 are mechanically actuated with adjustment-free cone clutches. When correctly matched to engine and propeller, every PRM unit will provide trouble-free operation for many years. All parts are designed for maximum reliability over an extended service life. In addition, running gear components are carefully specified and machined to the highest quality standards to ensure quiet and smooth operation. Purpose-designed for marine use, all standard version PRM gearboxes have output shafts vertically offset from the crankshaft centreline. However, to cater for the installation demands of the widest range of hulls, both the PRM260 and PRM750 are available with an in-line configuration, while down angle options are offered on the PRM750 (8°) and PRM1000 (10°), excluding 4:1 ratio versions. PRM80, PRM120 and PRM150 units are suitable for use with left-hand (anti-clockwise) rotating engines only. 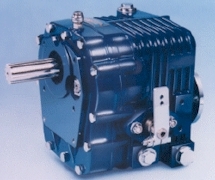 In standard form, all other PRM gearboxes are built for use with left-hand rotating engines, but can be converted simply to accommodate right-hand (clockwise) rotation engines by turning the oil pump through 180°. A wide range of mounting adapters is available to enable PRM gearboxes to be fitted to most popular engine models. An engine/gearbox matching chart is available on request. Hydraulically operated, adjustment-free multi-disc clutches ensure rapid response to operation of the control lever for good boat handling and maneuverability. All models are designed for use with proprietary single lever remote control operation systems. Be sure to check our New, Used & Surplus page for rebuilt and surplus Newage PRM gearboxes and many other marine transmissions.